Perhaps the most interesting of the early houses in this area is this pair of simple three-story and basement brick rowhouses. Architecturally, 49 Irving Place is among the outstanding houses in the Gramercy Park area. Although many houses erected in the 1840s survive in New York City, this dwelling is special for its ornamental detail. Of note are the stoop railing and extraordinary cast-iron veranda at the entrance on 17th Street, the adjacent three-sided oriel, and the cast-iron balcony on Irving Place with its wooden hood. This ornament may be original, or may date from an alteration, probably in the 1850s. No. 47 Irving Place also retains its original stoop ironwork, while the four-story rear extension of No. 49, dating from the 1850s or 1860s, has a large oriel and unusual dormer (similar dormers have been removed from No. 49). 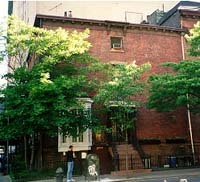 Great historic significance is often attached to the house at 49 Irving Place; it is claimed that the great American author Washington Irving once lived here. It is, however, unlikely that Washington Irving ever crossed the threshold of this house. No. 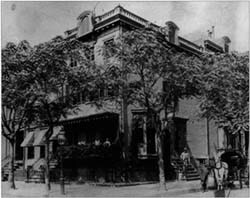 49 Irving Place was indisputably the home of Elsie de Wolfe, America's first professional interior decorator, and her companion Elisabeth Marbury, from 1892 to 1912; during this period they rented the house, running a famous salon here. No. 49 was considered for landmark designation by the Landmarks Preservation Commissin in 1966, but no action was taken. No. 47 is of historic interest as the site where Oscar Wilde lodged in 1883 while his unsuccessful play Vera was in rehearsal at the nearby Union Square Theater.